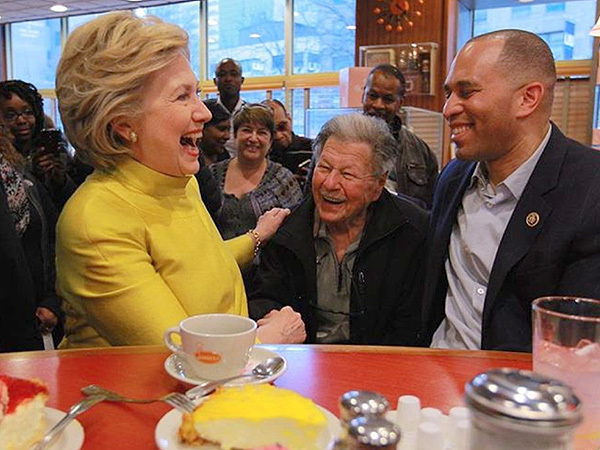 Foodies visiting New York, let Hillary Clinton be your guide. The day before the critical New York primary, the presidential hopeful and former New York senator served as a guest editor for Thrillist.com, where she named her favorite food and drink spots in the state. On the her “short, certainly incomplete, and constantly growing list,” is everything from a Syracuse barbecue joint to a Finger Lake winery and three New York City spots. Also, on the New York City list, iconic American chain Hillstone in the Flatiron and Midtown East neighborhoods, which is home to one of former president Bill Clinton’s favorite dishes. “Fact: Hillstone’s veggies burgers are so good, you can’t tell the difference. My vegan husband swears by them,” she said. RELATED: Get All the Details on Hillary Clinton’s Campaign Trail Diet — Ice Cream and Pork Chops Included!